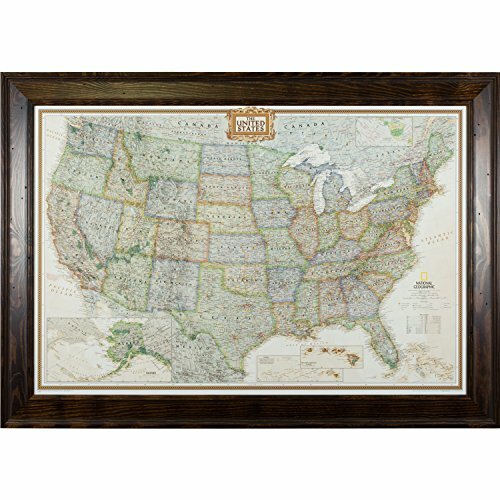 Keep a visual record of your travels stateside with a Wayfarer push-pin travel map. From the adept cartographers of National Geographic, the print depicts a Lambert conformal conic projection of our great republic in it's finest detail. Delightful flourishes and traditional earthly tones typify traditional styling, suitable for the more staid of home decor. This splendid print comes framed in our 57175204 Dark Walnut, featuring an angular profile with prominent wood grain and distress marks, finished with a low-gloss brown stain over solid Pine. Alternate uses for the Wayfarer include: office or customer locations, genealogy, research, and education. Let only your imagination be the limit. View More In Posters & Prints. If you have any questions about this product by Craig Frames, contact us by completing and submitting the form below. If you are looking for a specif part number, please include it with your message. Global Gallery James Wiens, Spirit Unicorn II Square' Giclee Stretched Canvas Artwork, 30 x 30"
© 2019 - enytheme.com. All Rights Reserved.